Heh, so a rubber band catch-up mechanic (like many racing games) when a regroup is ordered. Seems fine mostly on paper, but also seems like it could sort of be lightly exploited say if the carrier itself is under attack. Ordering a regroup instead of an engage order on one of the specific ships attacking the carrier, would result in them getting back faster. Huge problem? Eh not really, but is something to keep in mind. Yeah, this sounds gamey. Could we just order fighters to stay docked instead? It would be useful in some other contexts too. Then again, we already get reduced reinforcement rate loss from just setting fighters on regroup (before they actually reach regroup position)... So it may be a lost cause by this point. I mean, fighters already get a speed boost when moving into position relative to their wing leader, and I don't remember anyone worrying too much about that So just think of this as improving the consistency of fighter mechanics across the board. Could we just order fighters to stay docked instead? Hmm. It's more controls, it reduces the ability of pressure on the carrier to deal with its fighters, and it reduces the ability of the player to at-a-glance evaluate the state of a carrier's fighters, both friendly and enemy. For this particular case, I think it also probably wouldn't work very well because it would still require fighters to catch up with a moving carrier, or for the carrier to stop/slow down - which is actually a tough problem to solve for the AI, because of so many conflicting considerations, and a pain for the player. How much of a speed boost are you talking about here Alex? For catching up with the carrier when set to regroup. Up to the carrier's speed plus 20, right now. Which, generally speaking, means a slight boost to the slower bombers/Warthog when they're used with CH or Defective Manufactory, and that's mostly it. They don't zoom around or anything. so is the update coming before Christmas ? I'm more-or-less 90% sure (there's 10% uncertainty there) from my reading that altering Converted Hangars in that way is a reaction to min-maxing strategies that add Converted Hangars to (nearly) every ship in the fleet. While I still have a lot to learn about the game in its most recent iteration, I'm approaching the endgame in my current run, and I feel I know enough now to guarantee that I'd never put the altered version of that mod on a ship for any reason. I can think of a whole lot more use for 25-30+ total OP on a cruiser than installing a single hangar bay that produces one wing of slow fighters or bombers that die twice as quickly. I think this sort of general build has potential - bombers especially really give a combat ship a capability it otherwise wouldn't. Even if you just think of them in terms of being unlimited missiles - with extended range, to boot - the OP costs start to get fairly close what getting said missiles plus expanded racks, never mind that it doesn't need slots, and that it can be combined with other stuff the ship has to offer which normal carriers don't. And for bombers the penalties barely matter (hence the higher OP cost). So for the Enforcer, it's able to provide consistent longer-range support, while being very much a brick, *and* having good punch with its torpedoes. Is it better than a Drover? Definitely not as far as just fighters go, but it's also cheaper, can hold up much better to being outnumbered, and has a decent shot at turning the tide with a few well-placed torpedoes. Haven't had *too* much playtime with it yet, though, just got that setup going today. That said, yeah, it's definitely meant to be more a niche thing - something that changes how a ship plays entirely rather than enhancing its normal playstyle, if that makes sense. Sort of like SO in that sense. And it may indeed need a touch more balancing, we'll have to see! I also think the Warthog nerv is to much while Talons for 2OP seems fair. It was OP but I am not sure if its still worth using. But well we just need to test it... sooooo let us test it? The rest seems solid pretty solid to me. Great work. Keep on it! Sounds about right. I'm a tiny bit concerned that bombers are going to be able to skedaddle a bit too quick after they've dropped their payload, but I could only be sure if I had it in front of me. It sounds like it should be fine on any of the carriers in the base game -- bombers without a debuff already have quite a bit higher than 100 speed (Heron's 80 speed + 20) so it sounds like this will mostly be useful for countering the debuffs from CH or D-mods, or adding a tiny boost to especially slow bombers on especially fast carriers (SO + unstable injector drover? ) at best. 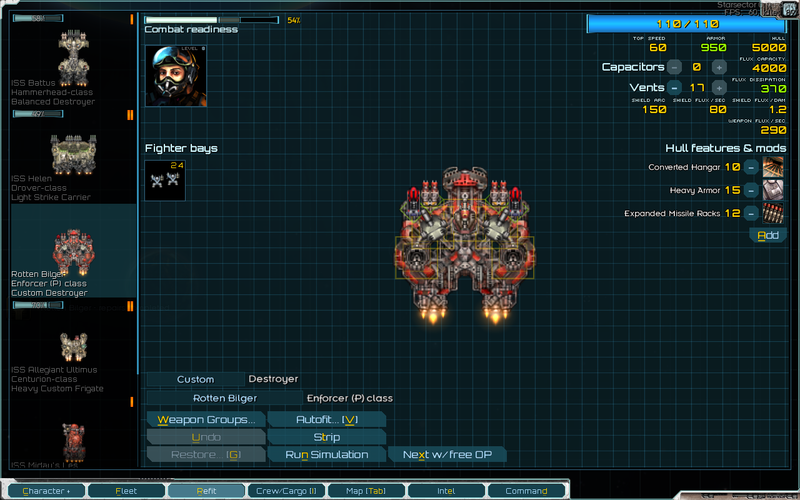 Mods that add stuff like fast destroyer or frigate carriers will definitely need to rebalance, though! I'm assuming here that Alex meant the carrier's Top Speed + the 0-flux boost, which is also what I was intending. The Heron is very nippy at 130 speed with that boost - more if you include hull mods. The Warthog only has a top speed of 130, and nearly all the bombers have less than 200 speed, the required speed to keep up with a 130 mothership that has either of the aforementioned d-mods. Though, come to think of it, the Warthog currently as it stands with these changes would be crawling along at 86 speed with the -33% speed bebuff when Engaged. That's brutal, it's a suicide mission for those guys. Better be packing Recovery Shuttles. I think that Recall might become poor-man's recall device. For a ship that is faster than its bombers, it might sense for ship to Recall after bombers drop their bombs so they return faster, then toggle back to Engage after they return to rearm. Perhaps bombers returning to rearm should automatically speed up to Recall speed (if that is faster) so that player does not need to fiddle with the Engage/Recall toggle to squeeze out maximum performance. Good point, did that. This is not going to affect much - just some of the bombers, and then only with the CH/etc speed debuff, not much else - but might as well. Has there been any changes to music in the new version? As in combat music and things like that.